Despite the fact that Android activations are nearly double iPhone activations, the iPhone remains the darling of the business world. In fact, it seems business prefer the iPhone to Android nearly 3-to-1. These facts come by way of Good Technology, which recently released the results of their own activations report. The report, which surveys mobile device trends in enterprise, relies on data from over 4,000 organizations worldwide, including Fortune 100 leaders in financial services, healthcare, retail, telecommunications, manufacturing, legal and government. According to the data, Android's enterprise activations grew by 10% quarter-over-quarter, capturing 36.9% of total activations. 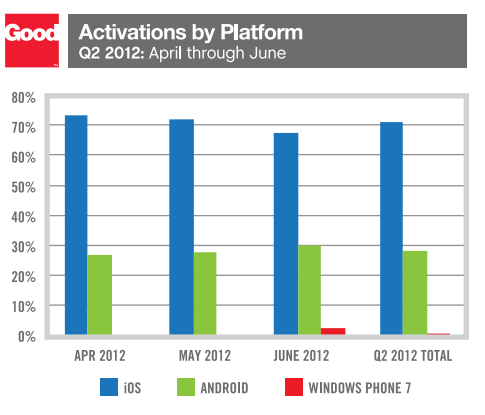 It's good news, considering the fact that Android's share was previously falling. But that's still far behind Apple's nearly 70% share of the market. Perhaps not surprisingly, the Galaxy S2 is the most popular Android smartphone in the boardroom, followed by the Droid RAZR, which has been heavily marketing itself to enterprise customers. So what's the deal with these low numbers? It could be that businesses have an unfair image of Android as being less secure compared to the iPhone. But John Herrema, the head of Good Technology, also thinks that fragmentation makes it harder for businesses to adopt Android and manage the many different models. But I'd take these numbers with a grain of salt. After all, it's not like Good Technology knows what's happening in every company around the world, just the ones they represent. I think it may be that Apple introduced Consumer Products that Businesses managed to pick up on & integrate into their Offices (or out in the field use) before their competitors were able to. It amazes me that Businesses still tend to want to use Consumer Electronic Goods 'til they are dead vs. replacing what is obviously outdated (I've actually repaired Computers at Call Centers that were so old they were still running Windows 2000 & had "fish tank" Monitors (lol). Why do you want Apple in a business setting? Because the apps are more "fun"? And you don't like Google because...? Unfortunately I use Macs in my field of of business (graphic design). I don't feel the need for any iOS devices for business. The tech savvy can do almost anything an iOS device can do on an Android platform. I honestly think it's the simplicity of iOS products that attracts most people. This simplicity is a huge deterrent for me. I mean, come on, one hardware button? Changing almost all settings in a settings app is ridiculous. What did you not understand? You can be #2 in the business world and #1 in the rest of the world, can't you? this article kicks off contradictory from the lead paragraph! WT?